We did really well at this trial. We were competing at the novice level. There were 17 other dogs in our division and we ended up with 7-1st place ribbons, 1-2nd place ribbon, a Q in Chances and 2-NQ's. Out of a possible 110 points we earned 90 and earned two new titles. We earned his NAC & NJC titles. His Yards Per Second were amazing, awesome start line stays, good contacts although a couple were near misses, and I was able to get a little distance when I wanted. Towards the end of the second day Nicoh was getting distracted but we got through it. I figure, after 11 runs over two days he was getting tired and less interested. I am very proud of him. Yea Nicoh!!!!! He's a good boy. This was our third NADAC trial and we have done 2 UKC trials. Thinking we will do some AKC Agility next year. 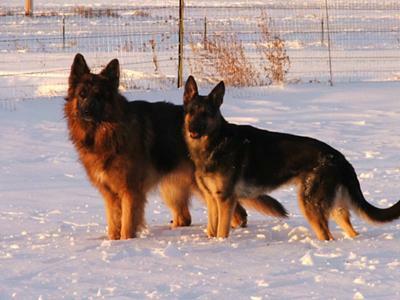 All of you German Shepherd owners out there should watch this video. Very cool and inspiring too. Oh yeah - thanks for watching and please come back often to see what else is going on in our growing German Shepherd community. Thanks for visiting us here at Total German Shepherd. And if you get the chance please leave some feedback below, place a video of your own or tell us your own GSD story in our sharing section. Great videos of Nicoh. They're lovely to watch and such an inspiration that I want to get my GSD Matryx into training for the same thing! Good luck in future contests.